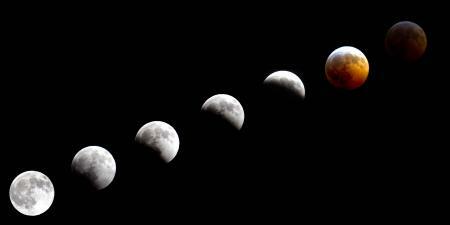 Eclipses occur in groups of two or three within an eclipse season which lasts for approximately 36 days. During this time any full or new moons occur as Lunar and Solar Eclipses respectively, although there can be a grey area at the very edge of an eclipse season when a ‘not quite an eclipse’ new or full moon occurs. An eclipse season occurs while the Sun is within eighteen degrees of one of the Moon’s Nodes, that is the points on the Moon’s orbital path where it crosses the path of the Sun. Eclipse seasons arise every six months. Generally speaking, eclipses get a bad rap, no doubt due to the fear they provoked in days gone by when total eclipses plunged people into blackness and the life-sustaining light was eradicated by a seemingly all powerful force. These days we’re better informed about their celestial mechanics. We know the light – be it solar or lunar – will return. We can marvel at the event if we’re lucky enough to experience it, without fearing for our very lives in the process. But still, within the collective psyche lies the fear of eclipses and all they represent. Whilst I would never suggest fear as a useful response to an approaching eclipse, I would certainly advise caution in terms of one’s level of consciousness. Eclipses are indeed times of great power when mighty forces are unleashed, so we need to stay alert to their action in our lives. Unlike our ancestors, however, we can recognise these are not forces apart from us, intent on our demise, but forces from within seeking acknowledgement and expression. Whilst eclipses sometimes augur events which throw our lives into complete turmoil, nothing happens in a life which is not characteristic of the individual who lives it. Astrology teaches this above all else. We are each fuelled by the energy depicted in our birth-chart whilst weaving our own unique pattern and thread throughout it. Our birth moment provides the raw material upon which we place our personal stamp with every thought, word and deed. So it is during an eclipse season, for whatever it brings – however surprising, unlikely, shocking, or welcome the events may be – they are born out of the fundamental energy field which is you and me. They are characteristic of who we are, of the path we must walk and the growth necessary to become all we can be. To perceive them as anything else is to deny the essential nature of our existence, woven through time and space and integral to the unfolding of this ever-expanding universe which requires we expand with it too. An eclipse may change one person’s life forever and leave another’s untouched, not because one was unlucky or fortunate, cursed or blessed, but because each individual by their very nature, experiences the energies of an eclipse as only they can. As only they must. Eclipses are notoriously unpredictable in their effects. Even aside from the actual eclipses, once we’re in their season all bets are off and anything could happen. Life often takes on a feeling of speeding–up in some way. Pressure mounts and tensions bubble over when we least expect it. Alternatively breakthroughs can occur and unexpected progress can be made. Sometimes both things are happening at the same time, and more! Eclipses teach that there are many other dimensions at work in our lives and we cannot, by any stretch of the imagination, control them all. We are subject to all manner of forces, influences and energies to which we must bow at times like this, recognising that, as the Dalai Lama once said, ‘Sometimes not getting what you want is a wonderful piece of luck’. Do we resist and struggle against the new timetable in our lives, or do we rip up the old one and get on with the new arrangement? I don’t know about you, but I’m just loaded with expectations from the minute I awake to the minute I flop into bed at the end of the day. Some seem fairly insignificant, like I expect there to be bread in the bread-bin for breakfast (and sometimes I discover we’ve eaten it all without realising), and I expect water to come out of the tap when I go to fill the kettle (and almost without fail it does). Others carry far more gravity: I expect to be able to walk when I get out of bed, and I expect my husband and I to end the day together, not separated through some life-shattering tragedy. But in truth no-one knows what the next moment holds and an eclipse season collectively reminds us of this, not to highlight the cruel twists of fate that play upon our lives, but to encourage us to awaken to the weight of expectation and begin to free ourselves from its constricting grip. Once we can do this (and I’m still practicing, believe me! ), life takes on a very different hue. The water that comes out of the tap becomes an everyday miracle that keeps us alive. The empty bread bin is a reminder that even breakfast cannot be predicted! The tragedy that we all pray will not befall us reveals one of the deepest mysteries of life: that even in our darkest hour we can find moments, seconds, of peace if we seek them, and that the thing we fear will break us, may eventually make us stronger and wiser. Within the constellation of expectations we all carry lie the roots of discontent, distress and dissatisfaction. The more energy we invest in them the less energy we have available when life doesn’t go to plan. The key is not to ensure that never happens (which we can’t do, no matter how hard we try!) but to embrace the fact that it does, thereby recognising that life is living us not the other way around. This is a central message of an eclipse season. One which we need to accept and, when possible, celebrate. Because if life only does what we want when we want, we are forever limited by our imaginations and the expectations dreamt up in our tiny and inconsequential minds. Once life is allowed to take over not even the sky’s the limit, and who knows where it could take us? What we deem an inconvenience can become the gateway to a whole new experience. What we label as a tragedy becomes the moment we recognise what really matters in life. What we see as a failure becomes the path to discovering a hidden talent we never even knew we had. So eclipse seasons should be welcomed along with all they have in store for us, both personally and collectively. Because whatever it is, we can rest assured that the biggest stumbling block will always be within us, in the form of our expectations and assumptions about life. Ultimately, it’s how we manage them that matters most at this unpredictable time of change. Click here for three common misunderstandings about eclipses. If you have found this article helpful, please consider making a donation if you’re able. Donations help us provide the free content on the site and are always greatly appreciated. To make a donation, please click on the button below.